this week's post comes courtesy of ian nagoski, founder of canary records and a legend among collectors of shellac. don't miss his new compilation, "brass pins & match heads", or his upcoming 3 cd restrospective of music of the ottoman diaspora in new york city from 1912-1931, due out this fall on tompkins square. this record features the talents of thai sakon impresario nakhon thanomsap, performing here as his blackface alter-ego, gunga din. 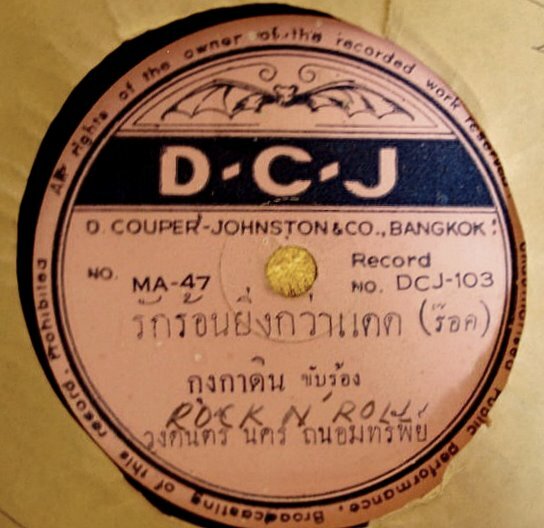 the number he turns in is a unique example of very early thai rock'n'roll, with a melody borrowed from jerry reed's 1957 tune "rockin' in baghdad". the b-side features bangkok crooner narit ari backed by mongkhon amatayakun's chularat band, with which both these singers were closely associated. nakhon thanomsap was credited with discovering & helping along the careers of a number of luk thung's early stars and is a tireless champion for the preservation of thai music from decades past. sadly, his own work is extremely hard to come across these days, possibly due to the politically incorrect nature of his "blacking up". anyhow, quite a find by ian... hope you all enjoy!! What a rarity! A big thanks to Ian! Best of luck with the Haji Maji comp release as well. this is bizarre and great. thanks! love the brass pins comp and this blog. this is amazing! if you have any other rock'n'roll I'd love to hear it. been on an Indonesian and Thai rock'n'roll kick lately.